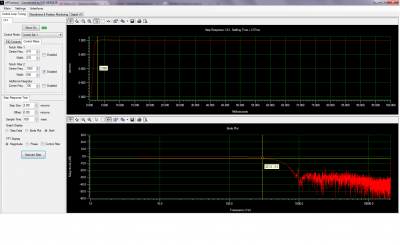 You are here: Home / Nanopositioning News / Blog / nPoint Blog / Selecting a System / How Fast Can I Scan With A Piezo Stage? 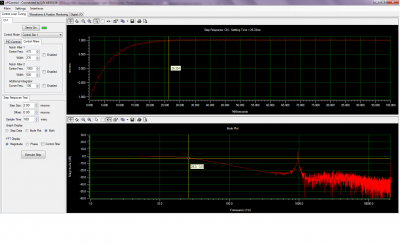 How Fast Can I Scan With A Piezo Stage? 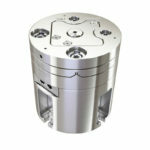 A typical nPoint nanopositioner consists of a flexure-guided sample platform that is driven by a stack actuator. 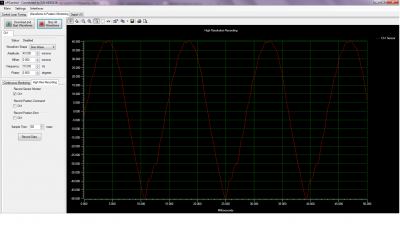 The motion of the platform is sensed by a position sensor; in most cases a capacitive one. The greatest speed limitation is the mechanical resonance of the structure. The lowest resonance frequency is typically the most important one. 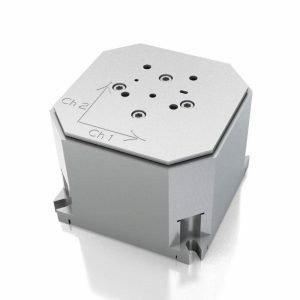 The resonance frequency is dependent on the mechanical design, the stiffness of the piezo used, and the sample load that is mounted on the moving platform. In the following few paragraphs we look at the scanning behavior of a nanopositioning system in closed-loop mode. 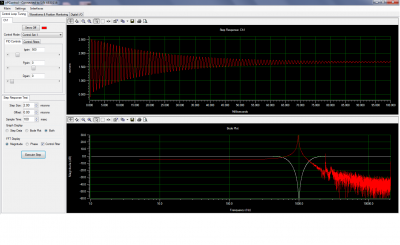 Closed-loop operation is desirable to eliminate piezo creep and hysteresis. A typical technique for control of nanopositioning systems is sensor-based feedback using proportional, integral, differential control (PID). The closed-loop bandwidth of a system is defined as the frequency at which the response of the system is reduced by 30% from the commanded input. The bandwidth value is a good indication of how fast a system can be driven. The resonance frequency of the system used here is approximately 1KHz as shown in Figure 1. When only PID gains are used, the bandwidth is greatly limited. Figure 2 below provides an example. 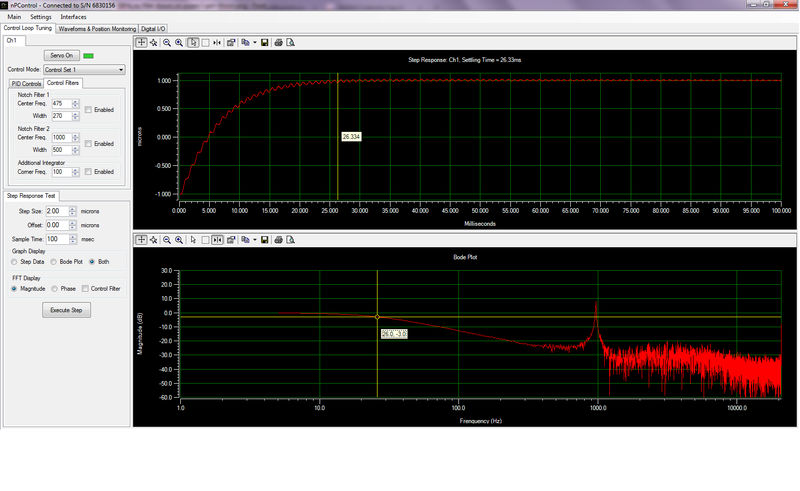 The I gain has been increased to make the step response reasonably fast although oscillations can still be seen. The measured bandwidth (-3dB) is approximately 26Hz. The use of notch filters greatly increases the bandwidth of the system. Figure 3 demonstrates the step response of the same system when notch filters are used. The bandwidth has increased to ~300Hz and the settling time has greatly reduced. Typically one should expect to achieve a bandwidth of 1/3 of the resonance frequency with the use of notch filters and appropriate I gain values. The bandwidth of a system is a good indication of how fast the system can respond. 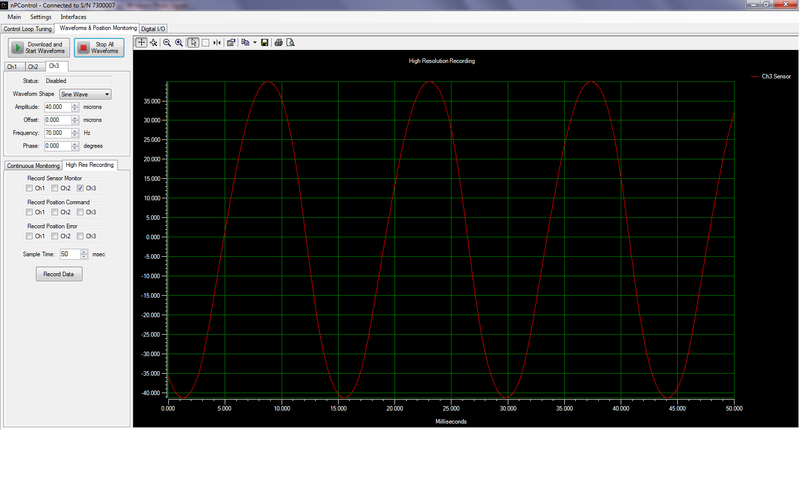 Looking at the Bode plot of Figure 3 one expects to drive the system up to 300Hz with good response. The amplitude of oscillation will of course decrease by 30% at 300Hz. The scanning data below shows the response of the system when it is commanded to scan 2um peak-to-peak in a sine-wave function at three different frequencies: 80Hz, 180Hz, and 300Hz. Initially the response keeps up with the command. At 300Hz, however is decreases to its predicted value. The waveform behavior is well defined in each of the above scans. Each scan has enough current for the piezo to expand at the velocity necessary to complete the waveform. In some instances, the current is not great enough and will be a limiting factor for scan speed. Figure 7 illustrates an 80μm sine wave at 70Hz. The controller used has a current limit of 100mA. 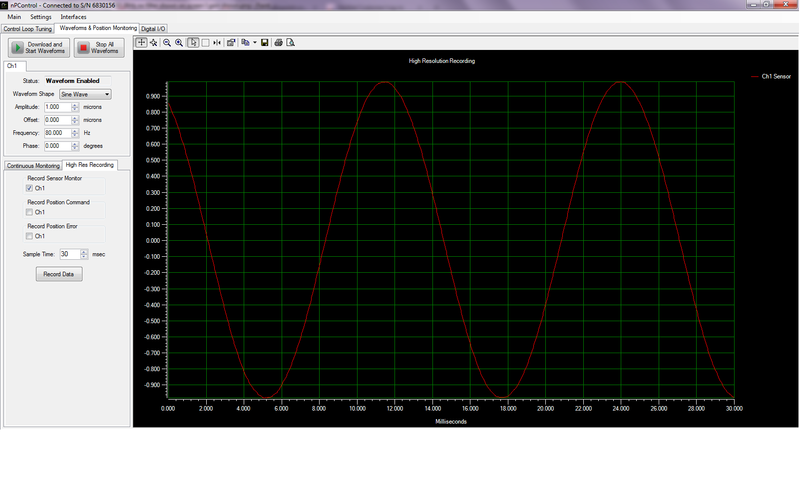 The sine wave is not well defined. Figure 8 uses the same stage with the same scanning conditions. A 300mA controller provides the current needed to drive the stage at the desired speed. In order to provide enough current for your application, please provide nPoint with the amplitude of the wave and scan speed to ensure it will be the right fit. 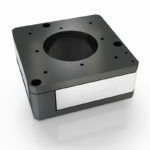 Scan speed is an important factor in many nanopositioning applications. Understanding how mechanical resonance, system controls, and electrical current will affect scan speed is necessary to find the right piezo stage for a given application. Please contact nPoint if you have any questions.